One of the many personalities of the unfolding Christmas nativity story that we can readily identify with is that of King Herod, the appointed king of the Judea by the Roman authorities who was the occupying force in Israel at the time. I do not refer to Herod’s notoriety of being capable of murder, including taking the lives of his blood relatives. That kind of identification is, thankfully, only applicable to a very ‘select’ few. I am referring to his insecurity and ego-centered fears. Despots and people of power who emerge as a result of instilling any sort of fear or terror in others will always live with a sense of unrest within themselves because of the dread and anxiety that someone will emerge and take this away from them, pulling as it were, the rug from beneath their feet. What the external demeanor displays often as confidence, control and influence often hide instead a sea of nervousness, worry and unease behind a gossamer wall that is strangely easily perceived with little discernment. But what is most arresting is the fact that powers who exert this kind of dominance cannot find it in them to fully appreciate the goodness, talents, skills and intelligence of others who are in their midst. Instead of working well with those who are under their leadership, enabling what is known as a win-win situation to develop, those in these seats of power, title and authority often choose to silence them. To those who are at the top of this shaky ladder, it appears that any person who is more talented, gifted, intelligent and popular is seen as a serious threat to one’s level of contentment. One very obvious reason for this is that it is very easy to get used to the position that power accords. One’s ego and one’s self worth then become easily associated with the fawnings and sycophantic behavior of those who serve them and report to them. Little wonder that one can then believe in one’s press and want this to last for as long as possible. When Herod was told of the intentions of the visiting Magi that they were looking for the infant King of the Jews, his insecurities were immediately revealed. His actions and his intentions were far from pure when he asked them to help him locate this infant king. His greatest fear was that he would be dethroned and lose his influence over the peoples. We have seen vignettes of this scenario played over and over again in history. We may also have had personal encounters with such insecure leaders and figures of authority in our work places, parliaments, and sadly and scandalously, in many religious settings like religious congregations and houses. Religious superiors can sometimes be negative examples of God’s presence in the ways that they carry out their appointments, and view the skills and talents of those under their charge with disdain and skepticism. How can one prevent oneself from falling into this kind of insidious and sinful behavior, where the very talents that one is surrounded by are so easily under-appreciated and under-valued and viewed through eyes filled with avarice and envy? How does one view another’s talents with a spirit of welcome and appreciation, and look to their gifts as something that completes them rather than compete with them? How does one remove the blinkers from one’s line of vision, so as to be well grounded? One of the things that can help us to keep this monster at bay from taking over our selves is to always have an eye that is constantly cast on the divine. That we are not our own makers, and that we will always have a power that is above us will keep us from becoming a power unto ourselves. This is what regular worship and prayer helps us to do. It is no wonder then that many despots and tyrants forbid any form of religion in their empires. True religion will always help us to keep ourselves from taking ourselves too seriously because we are reminded that the greatness and majesty and grandeur of God is who we give our honour and ultimate obeisance to. The wonder of the wise men was that they knew where their wisdom came from, and it was not from themselves. They who did not live in fear and insecurity were able to give true homage to divinity and deity whilst Herod who thought too highly of himself could only react in vexation and displeasure. What the wise men saw as beauty and godliness, Herod could only see threat and peril. When Mary proclaimed at the Magnificat that the ‘hungry will be filled with good things and the rich sent empty away’, she was an instrument of revelation of God’s way of overturning worldly and insecure powers. In many of the tableaux and scenes of the Christmas crib set up in churches and even in shopping malls, there will inevitably be figurines of the holy family, farm animals, shepherds, the wise men and the obligatory angels. It doesn’t take my effort to imagine ourselves as one of these ‘harmless’ personalities, but it also doesn’t give us much visual impetus to look deeper into ourselves where we may not be as hospitable to holiness and godliness as we should. Perhaps somewhere in these tableaux and setttings there should be a corner where Herod lurks, giving those of us who visit the scene of the nativity an entry point to ponder in what ways we too have been Herods in our lives, and raise our need for God’s mercy. In my very early years of my priesthood, I dabbled in some song writing and did a few recordings. One of the songs that I penned came from such a reflection as today’s, when I realized that it is when we forget that we have been divinely loved since the beginning of time that we allow our insecurities to develop and cause anxieties within ourselves. I have uploaded the recording of “I’m Secure” onto YouTube and it can be accessed here. I know it’s not a Christmas song by any means, but if Christ can be reborn anew in our hearts that give us a renewed way of living and a godly consciousness in our lives, Christmas becomes truly real. Consider this a gift from me to you, my reader, and have a truly blessed Christmas. Thank you for this beautiful post and song shared. Wishing you a Blessed Christmas and New Year 2015. Thank you Fr Luke for the Spirit-Filled gift of your song! Blessed Christmas and Hope- Filled New Year. I believe that the starting point for humility is to acknowledge that every good thing comes from the Lord: be it our intelligence, talents or abilities. Whether or not we are Mensa material, or near the bottom-end of the intelligence scale – it makes no difference. The gifts we possess are just that: gifts. They have been given to us. We have NO right to boast. That is why envy, and the desire for honour is such an awful thing. But being human, who can really say he is above ‘honour-seeking’, except for a tiny number of holy people? (St. John Vianney comes to mind). I am just as guilty as the next person, surely. It is only a matter of degree. And so it is crucial that I ask the Lord for forgiveness for my pride, and at the same time ask Him to give me the grace to resist this; arguably the strongest of temptations. God bless you, Fr. Luke. For those of us, who truly desire to make a change within ourselves, in making a difference for you and for me and those around us. - A Better Place to live in our world. This scripture text is certainly, FOOD FOR THOUGHT. ISAIAH 45:19 } - " I HAVE NOT SPOKEN IN SECRET or kept my purpose hidden. I am the Lord, and I speak the TRUTH; I make known what is RIGHT." He guides the humble in the RIGHT PATH. Thank you Fr. Luke - It's a Lovely Song. Peace and Joy be with you - Always. Have a Joyful and Blessed Christmas 2014. Thank you for the 2014 reflection and let me deepen my relationship with the Lord. Have a blessed Christmas and do continue to pray the list that I sent to you. Jesus always love you. The most commonly abused form of fear is authority. There is a need to suppress and ostracise others in the names of conformity and fear. In addition, there is a need to control if not attack others verbally. Those who love authority over others are in fact the ones who need to see the light of truth, for Jesus does not rule in our hearts by instilling fear but by love. For the distorted and battered sheep, Jesus said, "My sheep hear my voice; I know them, and they follow me" (John 10:27). Defensiveness gives rise to insecurity, being unsure of oneself and one's work. More so if insecurity stems from those who are more talented than you. Such is a widely practice in any workplace, institution and even churches. For those who become authoritarian or manipulative, moral impurity results in the form of secret conduct, that is living in sin. That form of immoral method produces the fruit of pride or exclusiveness for oneself. Scripture 2 Timothy 1:7 states that "For God has not given us the Spirit of fear; but of power, and of love, and of a sound mind." Thank you for that inspiring song and reflection. Such a timely reminder that we are all King Herods at one or more points in all our life's journeys. 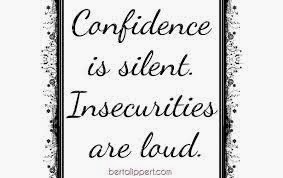 Insecurities are 'loud'. Well said and you have hit the nail on the head. We don't have to look far to see this is true. A mobile phone is all we need to create that massive attention we crave from friends we do not even know who 'thumbs up' and like everything we may do or say! It is now the technological and instantaneous ability to get whatever we want to say 'out there' that fuels and continues to fuel this fire. We need to discern what message we want to send out to the internet. Whether it's food for thought and spiritual development (as in your blog) or what the cat and parakeet did just now - which is often the mindless prattle we flip through and allow ourselves to be absorbed in through internet and social sites like Facebook. We need to question our motives for every time we want to post something out there for someone. This Christmas I have deactivated my Facebook account which I was on for 7 years of my life. After doing so many 'friends' were shocked and surprised at my actions. I had kept a baking blog/page of my baking adventures and did not realise how popular it had become. To suddenly pull the plug was good for me. But I was quite horrified at the 'following' I had created.....2015 will be for me a life of more discernment. To be lived more faithfully in God's footsteps. I have literally awaken from a 'dream state'. While I had learnt many skills over these years because I wanted to...I have now realised that it's really not important for 'them' to know. The attention seeking stops when you know that God loves you. Dear Father Luke, please continue your reflections. They have helped me some extent to see God's light especially during the times when I was blinded by my Herodian behaviour. We may not even know the insecurity we feel because we have been addicted by it. May God bless you and shower you with his blessings in the coming year! Meeting God in a dark cloud.